Well. . . As my lead article noted, time to get out the NEWS has been a problem. These are a year old. But THIS years Camp Fenby is just around the corner (July 4-6, 2002). Camp Fenby is an annual summer crafts get together of the Longship Company of the Marklanders. Marklanders are sort of like the SCA but not, their unofficial creed being "Not the SCA!" 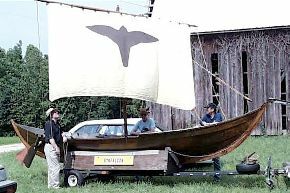 The Longship Company is a Viking group with two actual Viking craft. Left, some dry land rigging practice on the Longship Fyrdraca. 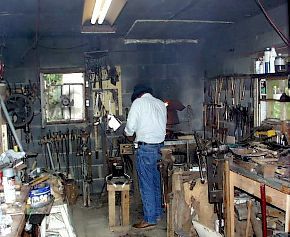 Bruce "Atli" Blackistone at his forge. Bruce's little shop is one of the most cramped I've seen but it does what it needs to do. Camp Fenby is held on the Blackistone family farm in Southern Maryland and could be called a mosquito and crab fest. Attedees have a crab dinner on Saturday night and the mosquitos feast all weekend. 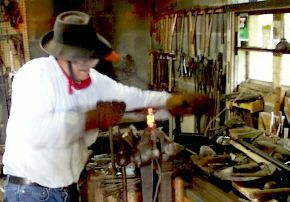 There are one or more forges setup and various crafts demonstrated and taught during the Fenby Weekend. Pewter casting in green sand, next page.